From Scratch-Cooking, Prepared “Fresh on the Spot!” How can we earn your business? Marcus Gilliam, Chef at Farm to Fork, said the interest in Corporate Catering was inspired by the demand from diners for more food options at the work place. With the explosion of interest in Healthier Eating, the “POP- UP” Catering Service has already proven to be a hit with businesses. Gilliam is not new to the Food Business! He has spent the last 15 years preparing food and serving a variety of clients, ranging from corporate, civic organizations, non-profit groups and individuals from Washington DC to Atlanta. In March of 2016 Gilliam opened Farm to Fork a fast casual restaurant where their mission is to provide healthier food for the community and where Gilliam currently works as executive chef. Owner and operator of International Events and established restaurateur Marcus Gilliam, is not new to the food business, he has cooked and catered events up and… down the East Coast since 2005. Now, with the launching of his new venture Farm To Fork, Marcus proudly returns to his home town of Emporia, VA to promote healthier living through combining modern sensibilities with southern soul; in an effort to create a place that bridges the gap between locally grown foods and the community at a distinctive dining destination in the south end of town. The new location will be a casual dinner that treasures the best of Southern living, both in style and culture. “Our style is what we like to call Rustic Chic,” says Gilliam, while highlighting the importance of local, naturally grown food and the relationship between suppliers and the chef. “Our goal with Farm To Fork is to create an atmosphere that truly resonates with the local community and celebrates the best of what surrounds us— great food and great people!!! Rooted in a core belief of cultivating community through a conscious commitment to locality and sustainability, Marcus and his team are tirelessly committed to seeking outstanding local products and the talents of passionate artisans, growers and purveyors to provide them with the defining ingredients that create the overall experience at Farm To Fork. Lead by Marcus Gilliam himself, Farm To Fork’s kitchen will be a workshop where a dedicated team creates ever-changing menus dictated by the season’s finest farm raised products and responsibly raised meats. With a hip Design, the sunlit urban space revokes a modern theme with a vibrant colors scheme, wide-open windows that wrap around the corner, creates an urban culinary experience. For our décor we used a lot of reclaimed materials, natural woods, clean vintage details that come together to create a hip space. A large 20-foot counter serves as a centerpiece of the interior, while the high-top tables and comfortable seating provides a place for friends and neighbors to await their orders. When you arrive to the location the first thing you will see is the outdoor patio, with plenty of parking in the back. Daily menus will offer market-fresh options such as the Free Range Chicken Sandwich or the Earth burger, 100% Grass Fed Beef burger which defines simple perfection with a slice of aged cheddar and a smearing of fancy sauce served on a fresh bun with organic toppings and a side of hand cut fries ($8) and the essential comfort dishes such as: Gilliam’s Famous Goal Post Wings ($8). Fresh Fish, Shrimp or Chicken served with a gourmet side dish and fresh vegetables ($12) and an assortment of Hand Crafted Taco’s ($3). Mornings at Farm to Fork start with our custom roasted coffee, we also serve “Sweet Stuff” Fresh baked Muffins and Loafs, served with house made spreads such as Apple Butter, Quince Jam, and Blueberry Compote ($2). Breakfast bowls with Creamy White Cheddar Stone ground Grits, topped with Eggs, choice of cheese and your choice of “Meat” turkey or pork bacon and sausage patty layered in a large bowl ($3). Breakfast sandwiches starting at ($2). Other tempting options include Organic Steel Cut Oatmeal with brown sugar and Organic raisins ($4). Breakfast Plate with 2 Farm Fresh Eggs, cracked to order, choice of meat, grits, potatoes and bread ($5). Farm To Fork will also specialize in Corporate Catering, providing daily drop-offs to your office or place of business. We also offer full-service catering for weddings, corporate events, fundraisers, diner parties, showers, cocktail parties, family reunions and more. We craft each event individually and can accommodate a range of visions and budgets. We can provide the following services to make your event effortless, gorgeous, and delicious: customized menus; venue selection; pre-event tastings; event design; coordination of rentals and staffing; onsite set up, plating, and breakdown. Farm to Fork will be open daily, serving Breakfast from 6:00 to 10:30 a.m.; followed by lunch and dinner served until 10:00 p.m. offering daily specials like Taco Tuesday with $2 taco’s , 35 cent Wing Wednesdays and Fish Fry Fridays just to name a few. Farm to Fork is Located at 647 South Main St in the city of Emporia, Virginia. For additional information, please contact 434-632-8161. Finding a caterer is not an easy job and calls for a well done homework before you begin your caterer search. 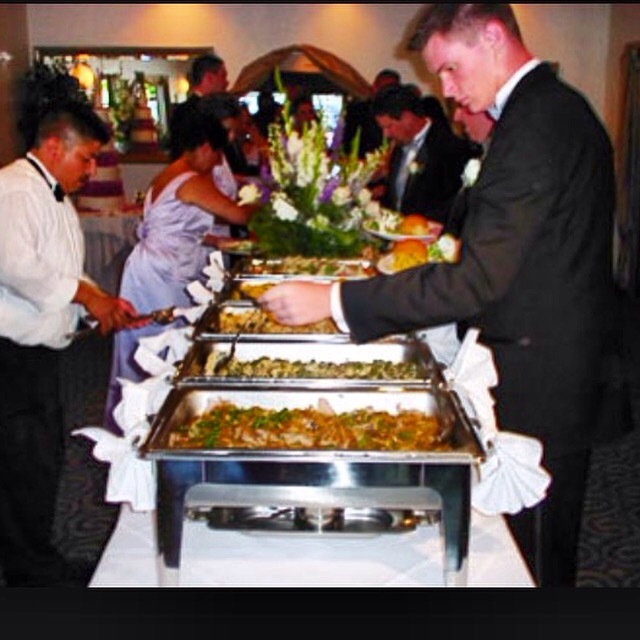 Many aspects of the event need to be sorted before hiring or searching a catering service. To avoid any type of confusion it is better to understand your budget, venue, number of guests, menus, type of catering services required whether you want separate food catering services, desired number of waiting staff, the dress code of the wait staff (optional), presentation/ decoration and rental equipments. Prepare a list of all these important things on a paper. May be you are good at remembering stuffs but it is always better to have a hard copy of list, to avoid forgetting. Then begin the search for best catering service for your event. For better research of catering services try to search caterers in every possible field from internet to family and friends. Internet is a big reservoir of various catering service companies whether it is full party catering or mere food catering, you can find a caterer from any part of the world by using a major search engine like Google, Yahoo or MSN, at your convenience. The search can further be filtered according to the requirement. Moreover, there are many websites on which you can post your event and invite bids from various best-suited professionals, like Bidgourmet.com. You can also ask your near and dear ones for their suggestions. Your personal experience in some party can also be helpful to make a choice of the catering services company. You can contact your friends whose party’s catering services you liked and take their caterers’ contact number. If you have any special food caterer in your mind then you can also hire separate food catering services and party catering services for your event. Many other things are also to be considered while finding an appropriate caterer for your event like catering service company’s license, permits, insurance coverage, experience and hidden costs if any. Before finalizing any catering service it is always better to ask for their recent past references and make sure to call these references to know about their services.